Scott Killgore joined the pastoral staff of Wyatt Park in 1996. 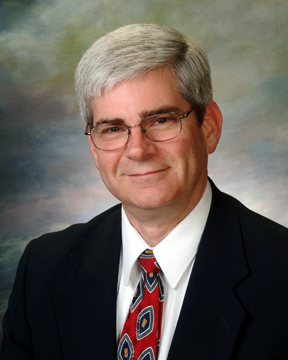 He served as Associate Pastor until January, 2006, when he succeeded Gene Mockabee as Senior Pastor. Scott oversees all of the church’s ministries and is the teacher (preacher) during worship most weekends each year. He has gone on numerous mission trips, including 1 trip to Jamaica, 3 trips to India in 1998, 2000, and January, 2013, and annual trips with the church’s high school youth for several years. He is active in the community, having served in the past on the boards of United Way of Greater St. Joseph and the Samaritan Counseling Center. He also served on the Capital Improvements Plan Citizens Committee for the city of St. Joseph. These days, he serves as on the Board of Directors of Inter/Serv, an inter-denominational social services ministry in St. Joseph, and as a volunteer on the mowing crew at St. Joseph's historic Mount Mora Cemetery. Scott is a native of northwest Missouri, having grown up at First Christian Church, Plattsburg. Prior to entering seminary in 1992, he spent 17 years in broadcast journalism. He earned numerous regional and national awards in a radio-TV career that took him to Kansas City, Detroit, Denver, Columbia, South Carolina, and Charlotte, North Carolina. He earned a BA in Business Administration (1992) from Queens College in Charlotte, NC. He earned a Master of Divinity degree (1996) in Kentucky and then in 2005, he completed a Doctor of Ministry in Christian Spirituality from Fuller Theological Seminary, Pasadena, CA. Scott enjoys bicycling, reading, photography, hiking (especially in the Rocky Mountains and the region around Lake Superior), walking the beach at Pawleys Island, South Carolina, and spending time on his farm north of Plattsburg. He and his wife Deirdra ("Deedie") have been married since 1976. They have three grown children - twin daughters, and a son. Evan joined WPCC in November of 2018. Evan serves as the Associate Pastor and his primary responsibilities include assisting Scott in all pastoral duties, as well as overseeing the High School ministry and the discipleship ministry of the church. Prior to arriving at WPCC, Evan spent 5 years in the states of Ohio and South Carolina serving as a youth and associate pastor. He also received training at Cedarvile University and Southwestern Theological Seminary where he earned his B.A. in Theology and M.A. in Theology and Discipleship respectively. He is currently pursuing his Doctor of Ministry in Preaching through Knox Theological Seminary. When not working as an associate pastor, you can find Evan reading, drinking coffee, training to finish the Ironman, or just spending time with his wife Lauren watching their latest favorite Disney movie or show on Netflix. When Lauren isn't spending time with Evan, she can be found either working on her latest photography project for her photography business or serving in various aspects at WPCC. Cindy Crouse joined the WPCC Ministry team in July, 2014 as the Administrative Pastor. In this position, Cindy is responsible for the overall leadership and direction of the church’s staff, leading all functional areas in the accomplishment of the church’s mission which includes discipleship, outreach, worship and the overall business aspects of the church. Cindy’s background includes 27 years in Education, primarily in Counseling. The last eight years she was the Coordinator of Counseling for the St. Joseph School District. Her experience also includes several years working with churches throughout the country in the area of finances where she coordinated and conducted several capital campaigns. Cindy graduated from Missouri Western State University and Northwest Missouri State University studying education, counseling and administration. Cindy draws on her background of teaching to lead a couple of Bible Studies and a grief support group. Cindy enjoys gardening, reading, walking and most of all just being with family. She and her husband, John, live on a farm east of St. Joseph. Their family consists of Jami (AJ), Jill (Andrew), Jessica and three grandchildren, Drew, Lottie and Laynie. Tonya joined the staff of Wyatt Park in May 2014 after volunteering in the Children’s Ministry Program in many capacities. In her current role as Children's Ministry Director she leads ministry that will enable children (preschool through middle school) to know, love and follow Jesus Christ. Tonya is originally from northwest Missouri but after attending college at the University of Central Missouri, Tonya and her husband David lived throughout Missouri and Central and southern Indiana before returning to the Saint Joseph area in 2005. When looking for a church home they wanted a church that had an active children and youth program since they have four children. While searching the internet Tonya found Wyatt Park Christian Church. She liked all that WPCC offered for children... little did she know that God would call her to serve the children of WPCC. If you ever want to talk more about children's ministry, Tonya would love to talk to you. Mark Pennington was born and raised outside of St. Joseph, Missouri, and grew up in a small rural Christian church. It was there that he began using his talents and building his musical skills as a vocalist and pianist. By the time he entered high school he was leading worship, playing the piano and the organ, and singing in the choir. Mark left northwest Missouri to attend Kansas State University where he majored in Speech and Theatre. From there, he went on to become an entertainer singing and dancing with legendary Broadway actress Carol Channing in the national tour of “Hello, Dolly!” and singing back-up for the legendary country & western singer Eddy Arnold. He lived in NYC for thirteen years and performed in clubs, theatres, and on national television, as well as continuing to perform nationally and internationally. In 1996, Mark returned to the St. Joseph area and again began to apply his music skills in worship as worship director at Central Christian. In 2003, he began leading the contemporary praise service at Wyatt Park Christian as well as planning worship. In 2013, he took over as the Director of Worship and now oversees the worship arts at Wyatt Park. Mark’s full time job is teaching middle school and high school students in the East Buchanan C-1 School District where he also oversees drama productions. Prior to that, he was a vocal music and theatre teacher at Central High School in St. Joseph. Mark is currently pursuing his Masters of Music Education at the Conservatory of Music and Dance on the UMKC campus. Peggy joined the office staff in 1997 part-time as Communications Secretary, and in 2012 added the responsibilities of Office Manager. Her duties include preparing the weekly worship bulletins, the monthly church newsletter, The Call to Worship, and other mailings as needed. Her added duties as Office Manager include ordering supplies, paying the bills and preparing the monthly financial statements. Peggy graduated from Missouri Western State University with a Business Degree in Accounting. Her prior work experience includes 14 years as a secretary at the American Angus Association. Peggy and her husband, Darren (retired worship director for WPCC), live in St. Joseph. They have one grown son, Tyler.